We had planned to be the first to produce an article about the Virgin Trains East Coast refurbished carriages but in the end we're almost two months late. The first refurbished train was meant to be launched to coincide with the start of a direct service from Sunderland, so seat was booked on that service but delays to the refurbishment meant that it was an unrefurbished set. The first refurbished set was launched just after Christmas and because of previous plans meant I couldn't be on the first service, I had then planned to go on the refurbished set a few days later but earlier delays that day meant that a set swap occurred and instead of a refurbished train I was on a train with the old East Midlands Trains seat (Virgin Trains East Coast have trains from EMT to provide extra capacity but the seats are extremely old). Unlike many members of the press that just cut and pasted the press release we decided we couldn't publish an article until one of us had been on the train and it was me who ended up having to do this. So after all that and having no luck encountering a refurbished set on my regular travels I decided to take my first free weekend in 2016 and specifically travel on one of these trains, fortunately this time no late set swaps hindered my plans. Back in the 2000's GNER decided to do a major refurbishment of the fleet, the first trains to be refurbished were the IC225 (Class 91 + Mk4 sets) trains and this was dubbet Project Mallard. This refit included completely new seats, sockets in both classes (except for the coach with the kitchen), one of the toilets in first and standard converted for disabled use, the new style buffet counter and even smoking areas with much improved ventilation (which of course were removed ahead of the smoking ban - they were in the ends of coach B and M). Following this the IC125/HST (Class 43 + Mk 3 sets) trains were done although on these trains they left the buffet area pretty much the same as before the refurb and the only disabled toilet was in standard and on these trains the socketless coach with the kitchen is in first class. This wasn't a big deal at the time as this coach was used as a restaurant and mobile phones tended to last days so most people wanting a socket would be those with laptops. The refurbished Virgin Trains East Coast sets have been given the #PlushTush hashtag on Twitter and have retained the same seats as the 'Mallard' refurb but have new seat covers. As expected with Virgin there's a lot of red. The seats in standard class have three different shades of red and are made of cloth, it feels like the same material as previously. In first class the seats are no longer covered in cloth but instead with leather. The seats are mostly black with a red trim and the Virgin logo on the headrest. As well as the seats, the tables have a new covering, the carpets are all new and the toilets have also received an interior refresh. Currently there's 3 HSTs that have been refurbished, the first IC225 set should be coming along shortly. The plan is to have one train a week refurbished but the process as still not quite got up to speed yet. Some of these trains will have mood lighting in first class. I'm not sure if it will be extended to all of them if the feedback is positive. Although the Mallard refurbishment did a good job of getting the GNER fleet up to modern standards the interiors were starting to get worn out. This refurbishment keeps the seats, which are fine, and gives them a new lease of life which will last them until the fleet is retired. The colours took a bit of getting used to in standard as there's so much red but I think I'll like it when I get used to it. I'd rather have some colour rather than endless rows of grey that some train operators use. The seats feel firmer because the padding is new, so you may notice a difference. It's also important to know that the number of seats on the train has not been changed, this means the legroom is the same. When British Airways refurbished their shorthaul fleet they used the opportunity to reduce the legroom and cram in more seats, fortunately this didn't happen here. I was hoping the refurbishment would have gone a bit further in first class. 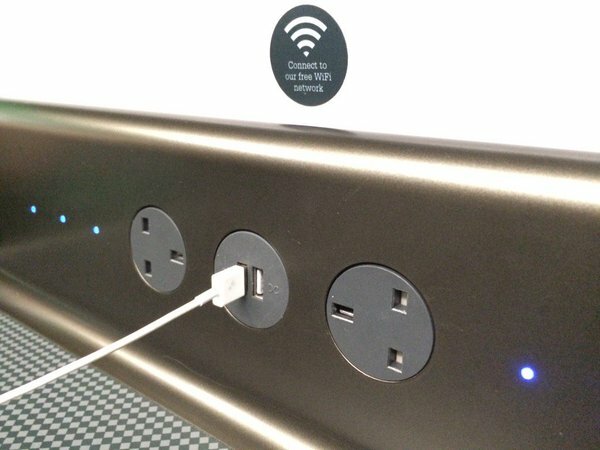 Great Western Railway has a excellent power provision (see below) that includes regular power sockets and USB sockets at table level, whereas the Virgin refit just retains the regular sockets under the table. Having USB sockets means you don't need to carry round a plug to charge your smartphone, all you need is the cable. If you've not got a bag with you it's a lot easier just to stick a cable in your pocket. As it's probably to late to match GWR on the power provision they could at least fit sockets that support a regular plug as well as USB. Also the trains still do not have sockets in the carriage with the kitchen, however I have been told this is something they're looking into so hopefully it won't be too long before we get power in all coaches. Overall it's a decent effort and it gives the trains a new lease of life until they're retired. As the train I was on was busy I didn't want to take any pictures. However @JaJaWa has taken 51 excellent quality photos you can view on Flickr. Does a triple points offer really reward loyalty?